You’ve pictured it often: a kitchen tailored to your specific style and culinary needs. Perhaps that means finishes that the kids can’t smudge or smart features that make cleanup a breeze. Whether you’re building a new home or planning an upgrade, such enhancements dispense with the conventional and welcome the customized. 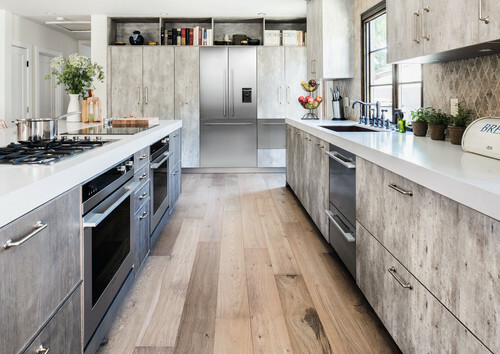 Fisher & Paykel, a premium appliance brand, shares four ways to turn your kitchen into a luxurious space that’s truly yours. Visualizing solutions to layout challenges is an exciting first stage in personalizing a kitchen. Want a cooktop by the window so you can enjoy more natural light? How about three wall ovens in a horizontal space or recessed lighting to differentiate workstations?While freedom is liberating, make final decisions that suit your everyday needs. If your kids do homework in the kitchen, opt for a large island so you can help with spelling as you sauté. Expansive prep space is also ideal for couples who tag-team dinner. Try aninduction cooktop that sits flush with an extended counter, offering easy access to ingredients and space for a cookbook. It makes a workstation feel as streamlined as any other design pairing and provides room for culinary magic.Widen walk-through space for optimal flow, and match your appliance placements to your cooking routines. 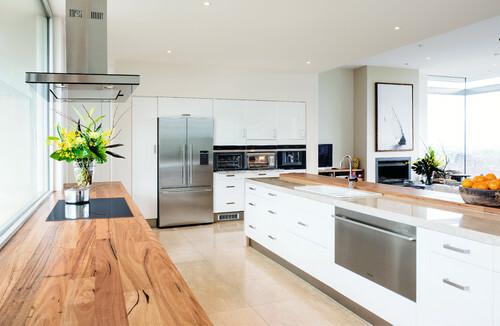 There’s no need to stick to a traditional kitchen layout if a more customized one suits you better. Now that the layout is settled, think about what you use most often — and what you don’t. Are you ready for recipes that reach beyond “bake”? An oven with a host of settings as well as the capacity to handle large roasts or casseroles rises to many an occasion.If you’re tired of bending over to load and unload the dishwasher, consider an ergonomic dish drawer like the one seen here. Double dish drawers take up the same amount of space as a conventional dishwasher, but cycling between them ensures that clean dishes are always at the ready. Shave off more time by placing floating shelving above the dishwasher, perhaps in a butcher block to complement your countertops. Place flatware and cutlery next to the dishwasher rather than in the island behind you.These days, the ease of tech also makes customized choices practical and efficient. Gone are those kid-enticing temperature-control knobs of yesteryear’s cooktops. Touch controls that don’t protrude and surfaces that stay cool instead of letting spills cake on make cleanup as easy as a once-over wipe down. With the basics in place, it’s on to those personal luxuries on your wish list. 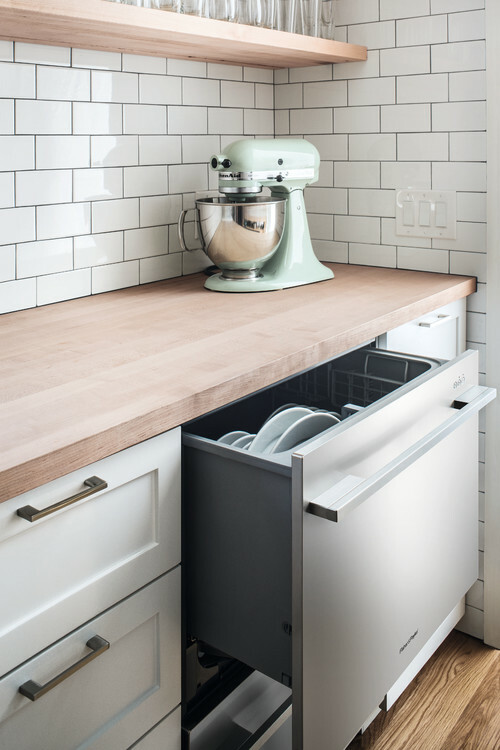 If you run out of refrigerator or freezer space ahead of entertaining (or pantry space after stocking up on groceries), then a cool drawer may be the ticket — or button — to optimized luxury. Change the temperature depending on your needs to keep the birthday cake cool, chill the wine, freeze the leftovers or handle pantry overflow.The refrigerator, a kitchen cornerstone, can also go luxe. French doors are increasingly popular, while adjustable panels and minimal door gaps add to a sleek, orderly look. Limit aesthetic distractions by designing flush cabinetry around the refrigerator, as seen here. High shelving for books and beloved objects provides depth and dimension.And get creative with that island. If you’ve prioritized wall space for storage but want the convenience of a double oven, get side-by-side built-ins that stay cool to the touch. Tuck in your microwave to leave upper cabinetry undisturbed. There’s a reason we call them finishes. Here, at the end of the long line of design decisions, are the artistic rewards you originally visualized. To match form and function, look to your appliances for style options, such as stainless steel or wood paneling. Both can lean minimalist, contemporary or transitional and offer opportunities for contrast and coordination. 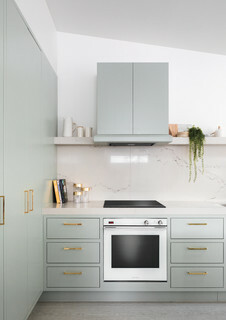 Brass hardware, for instance, is on trend and a metallic complement to brushed stainless steel.After years of neutral kitchens, bold colors and two-toned cabinetry are stepping into the limelight. Because you want your enhancements to last, choose a soft hue to add a chic contrast to traditional white, as executed here against a variegated backsplash and vaulted ceiling. Coordinate your range hood with your cabinetry, and flank it with a single open shelf on either side for a clean yet layered look.Well-ordered, easy to use and utterly yours, customization and a cohesive aesthetic can make your kitchen as lovely as any other room in your house.